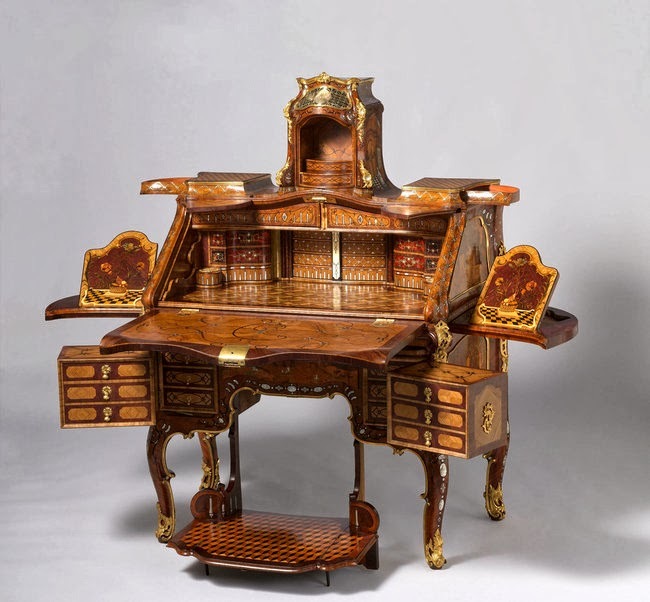 An extraordinary exhibition last year at the Metropolitan Museum of Art featured mechanical furniture designed by the father and son team of Abraham and David Roentgen: elaborate 18th-century technical devices disguised as desks and tables. First, a quick bit of historical framing, courtesy of the Museum itself: "The meteoric rise of the workshop of Abraham Roentgen (1711–1793) and his son David (1743–1807) blazed across eighteenth-century continental Europe. 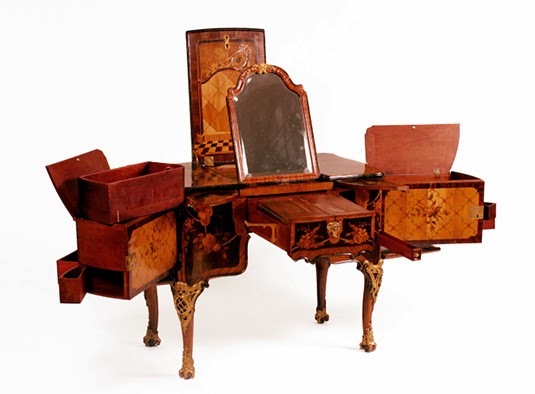 From about 1742 to its closing in the early 1800s, the Roentgens' innovative designs were combined with intriguing mechanical devices to revolutionize traditional French and English furniture types." Each piece, the Museum adds, was as much "an ingenious technical invention" as it was "a magnificent work of art," an "elaborate mechanism" or series of "complicated mechanical devices" that sat waiting inside palaces and parlors for someone to come along and activate them. But it doesn't stop there. Further surfaces split in half to reveal yet more trays, files, and shelves that unlatch, swivel, and slide aside to expose entire other cantilevered parts of the furniture, materializing as if from nowhere on little rails and hinges. 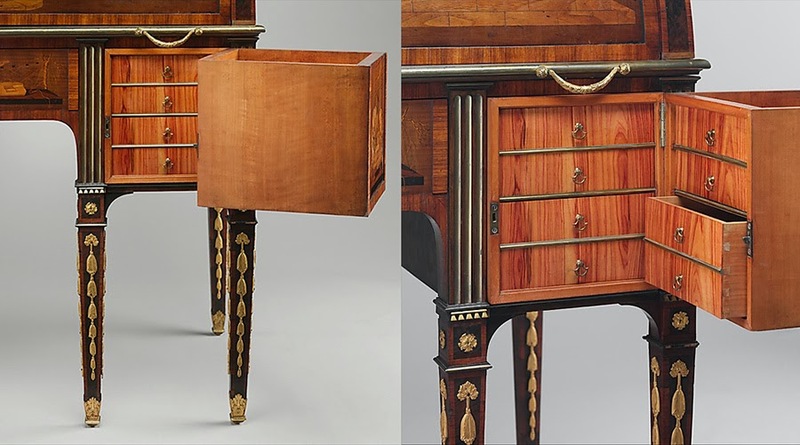 As the Museum phrases it, Abraham Roentgen's "mechanical ingenuity" was "exemplified by the workings of the lower section" of one of the desks on display in the show: "when the key of the lower drawer is turned to the right, the side drawers spring open; if a button is pressed on the underside of these drawers, each swings aside to reveal three other drawers." What was so fascinating about the exhibition—and this can be seen, for example, in some of the short accompanying videos (a few of which are archived on the Metropolitan Museum of Art's website)—is that you always seemed to have reached the final state, the fullest possible unfolding of the furniture, only for some other little keyhole to appear or some latch to be depressed in just the right way, and the thing just keeps on going, promising infinite possible expansions, as if a single piece of furniture could pop open into endless sub-spaces that are eventually larger than the room it is stored within. The top of a table might include, for example, the accurately rendered, gridded space of a drawing room, as if you were peering, almost cinematically, into a building located elsewhere; meanwhile, pop-up panels might include a checkerboard reference to other possible spaces that thus seemed to exist somewhere within or behind the furniture, lending each piece the feel of a portal or visual gateway into vast and multidimensional mansions tucked away inside. The giddiness of it all—at least for me—was the implication that you could decorate a house with pieces of furniture; however, when unfolded to their maximum possible extent, these same objects might volumetrically increase the internal surface area of that house several times over, doubling, tripling, quadrupling its available volume. But it's not magic or the supernatural—it's not quadraturin—it's just advanced carpentry, using millimeter-precise joinery and a constellation of unseen hinges. You could imagine, for example, a new type of house; it's got a central service core lined with small elevators. Wooden boxes, perhaps four feet cubed, pass up and down inside the walls of the house, riding this network of dumbwaiters from floor to floor, where they occasionally stop, when a resident demands it. 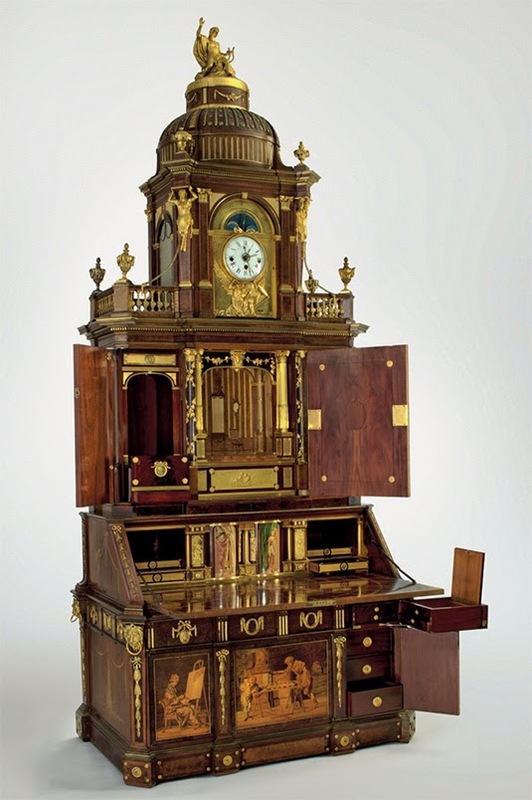 That resident then pops open the elevator door and begins to unfold the box inside, unlatching and expanding it outward into the room, this Roentgen object full of doors, drawers, and shelves, cantilevered panels, tabletops, and dividers. But then you reverse the process and go back through it all the other direction, painstakingly shutting panels, locking drawers, pushing small boxes inside of larger boxes, and tucking it all up again, compressing it like a JPG back into the original, ultra-dense cube it all came from. You're like some homebound god of superstrings tying up and hiding part of the universe so that others might someday rediscover it. Furnishings for the TARDIS. Been missing these speculative articles! Well, I like the the dainty little details and inlays, and I've been a BLDGBLOG reader since 2006. As a practicing artist currently building a mechanised 'language machine', the visuals at 1:58 made me weak at the knees. To have coffee with the Roentgens indeed! Further mechanical posts/links to previous posts devoured.. I love the styling and the details as well as the mechanical stuff. I want every one of them and a huge Victorian mansion to put them in. This type of furniture is amazing! 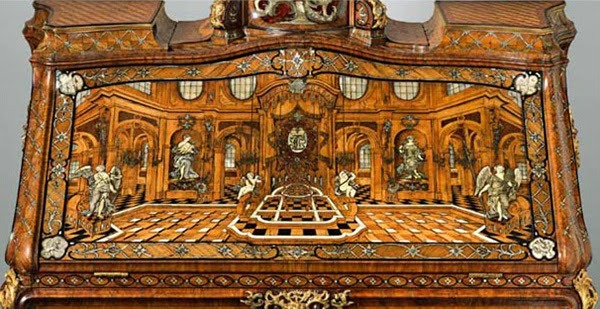 Think about how important was the desk at the time, and the details that decorate it...Our ancestor had a finer taste for art and they were more preoccupied with than us, don't you think so? I have stumbled upon your bog page through Google+ and I must say..These are just pure genius! I'd love to have all of my furniture to have hidden buttons and reveal hidden spots. Unfortunately, I haven't seen a furniture that can do that. Great post! I wonder if this is what inspired Terry Pratchett to create the Cabinet of Curiosity in the Discworld books. Furniture to decorate your tesseract. Transformers, eat your puny metal hearts out!